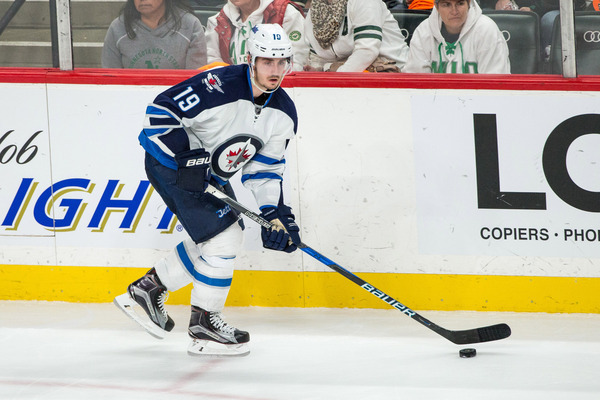 Fans haven’t been shy about voicing their discontent with one Nic Petan and how he’s played. Fairly or otherwise, he’s firmly in their crosshairs. I tend to think much of this is borne of Petan’s suffering a 95.8 PDO. That number is likely to regress to the league’s mean, and as it does, it will influence how fans and experts alike view Petan’s season. Bad luck might not be the only factor at work here, though. What if deployment and usage are responsible for Petan’s poor outward perception? Petan’s just a paltry 18 points to his credit in 68 NHL career games. Prorated over a full season, this year looks like 23.4 points — or what one might expect from a third line forward, on the low end. Petan’s underlying metrics aren’t appreciably better either. While Petan’s struggled to produce offence at even strength beyond a fourth line rate, he’s excelled on the power play. Petan’s the fifth best producer of offence on the power play when one adjusts for ice-time in his time as a Jet and ranks second in Winnipeg this season. Perhaps unsurprisingly it’s Petan’s playmaking ability which is primarily responsible for his success with the man advantage. Petan’s contributing 0.87 primary assists per hour this season. So too has Petan performed relatively well by even strength Corsi for and Expected Goals given his most frequent linemates. Petan’s played most frequently this season with Andrew Copp and Chris Thorburn, players who sit at 47% and 45.5% Corsi For percentage away from Petan. Petan’s linemates control a 1.5% higher ratio of shot attempts with him than they do away. That kind of impact on teammates’ shot attempt ratios ranks fifth on the Jets, behind just Blake Wheeler, Mathieu Perreault, Bryan Little and Adam Lowry. This is where I get to that bit about Petan’s ugly PDO as a big driver in fan angst relative to how well he’s performed. Don’t let PDO’s name fool you — it’s quite simple, and the acronym doesn’t even stand for anything. PDO is just the addition of a team’s 5v5 shooting and save percentages when a player is on the ice. Due to the highly variant and low sample of goals, extreme values of PDO have a substantial likelihood in regressing to the mean. For these reasons, it is often used as a measure to describe “luck” in hockey. What PDO aims to illustrate is the (sometimes) stark difference between a player’s goal and shot differentials and contextualize the disconnect whenever it’s present. It does do an okay job of looking at players who may be lucky/unlucky in some perspective since we know goals regress towards shots and goals strongly influence opinions on players. Petan’s 95.8 PDO ranks as the lowest on the Jets’ after Perreault. The 95.8 means the Jets’ shooting percentage is 4.2 points lower than the opponents with Petan on the ice. It’s highly unlikely the Jets continue to score on only 5.6 percent of shots while the opponents score on 9.8 percent. Given this information, one can surmise Petan’s on-ice goal results likely belie his true talent level. His ability to produce even-strength offence is hampered substantially by unsustainably low percentages. As much as Petan’s suffered bad luck, one can also say something for the peculiar role the Jets thrust him into upon his NHL debut. Petan, a former 358 point scorer over 252 WHL games, played out of position at right wing flanking Copp and opposite Thorburn. Copp was, at this time, a rookie fresh out of the NCAA who played a prototypical fourth-line game with glimpses of skill, particularly with his shot. Thorburn was a veteran staple on the Jets fourth line who’d long ago settled into a leadership role most vaunted for his pugilism. The idea was to use Petan as a power play specialist with limited 5-on-5 minutes. That line was, predictably, bad. They stunk. Teams outshot and out-chanced the Jets at their best rate when facing that line. That was an instance where the whole was worse than the sum of its parts. Petan was sent down to the AHL where he was the best offensive player on the team by a mile. He earned a call-up from his performance. Upon returning to the NHL, Petan played in a more suiting role to better effect. This season we saw something similar, although this time one of Copp and Thorburn were occasionally swapped for Drew Stafford or Brandon Tanev. At first, I was thinking of this as the typical “players play better with better players”… but then I noticed the pattern. Below are Petan’s 5v5 numbers in two separate situations where he played on a line for more than 20 minutes. One situation is where he plays with the very prototypical “North/South” type players who are prone to dump and chase entries: Copp-Thorburn, Copp-Stafford, and Thorburn-Tanev. The other is Petan with more “skill” type players: Wheeler with a rotation of Ehlers, Connor, Scheifele, and Dano. This is not just Petan playing better with better players. The results are more extreme. The “good” is better than expected, and the “bad” worse. The results are probably somewhat unsustainable. This would essentially place Petan as a top 30 forward in the NHL. Not impossible, but also not probable. However, they are still meaningful. The dichotomy is something. We expect better players to make those around them better. We expect Petan to be relatively better with the top players than bottom-tier players. We do not expect the bottom players to be worse with Petan than without, nor do we expect the best players to be that good with Petan. Obviously, chemistry is playing a role in the results in addition to accumulating more skill players on a line. The role player trope is overplayed. No team needs any particular type of role player beyond players that help your team win. A player’s role merely classifies their means in hopefully achieving that end. That said, there’s something there when it comes to roles and chemistry, it seems. Each line’s performance appears to be more than just the sum of its parts. There is a huge divide in results between Petan playing with the two different types of players. Not only are the results fairly different, but the different lines seem to be fairly consistent in those differences. For a long while, I’ve been a strong proponent of running three scoring lines. The top-six/bottom-six system in the NHL is dead for some while, and while the Jets have been struggling to meet this level, the NHL has been evolving even further. Just last season we saw the Pittsburgh Penguins win a cup running four lines, three of which carried first line talents. The Jets have enough skilled forwards to emulate this strategy next year. Hopefully they do. All numbers are courtesy of Corsica.hockey.